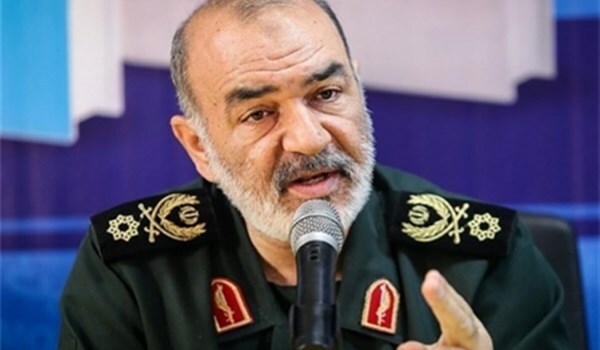 Lieutenant Commander of the Islamic Revolution Guards Corps Brigadier General Hossein Salami underlined that the IRGC’s recent missile strikes on ISIL terrorists in Syria was a stern warning to the enemies of Iran. The Islamic Revolutionary Guard Corps is fully ready to fight any enemy at any scale, Salami said, addressing a ceremony in the Central city of Qom on Sunday. He added that great victories have been achieved in recent days and the roar of IRGC missiles gave a strong warning to the enemies of the Islamic Republic. General Salami also said that the US is being isolated in the world and is losing its allies, while Iran is at the heart of region’s political developments and cannot be isolated. Today, all the world is uniting against the US and no country helps it with its measures against Iran, added the commander. The IRGC in response to the September 22 terrorist attacks in Southwestern Iran launched drone and missile strikes on ISIL strongholds in Eastern Syria on October 1. The terrorists attacked the bystanders watching the annual Armed Forces’ parades, marking the start of the Sacred Defense Week, commemorating Iranians’ sacrifices during the 8 years of the Iraqi imposed war on Iran in 1980s, in disguise of the IRGC and Basij (volunteer) forces, killing and wounding several people, including innocent women and children. In response, the IRGC fired 6 ballistic ground-to-ground missiles and launched drone attacks on terrorists’ positions in Eastern Euphrates region in Eastern Syria. During the operations codenamed Zarbat-e Moharram (Blow of Moharram) carried out at 2:00 AM (local time) October 1 against the headquarters of Takfiri terrorists near Albu Kamal region in Eastern Euphrates was attacked from Kermanshah province in Western Iran, 570km away from the targets. The IRGC’s Aerospace Force Brigadier General Amir Ali Hajizadeh announced later that the missile and drone strikes against the terrorist targets in Syria killed 40 ISIL commanders and smashed all targets.